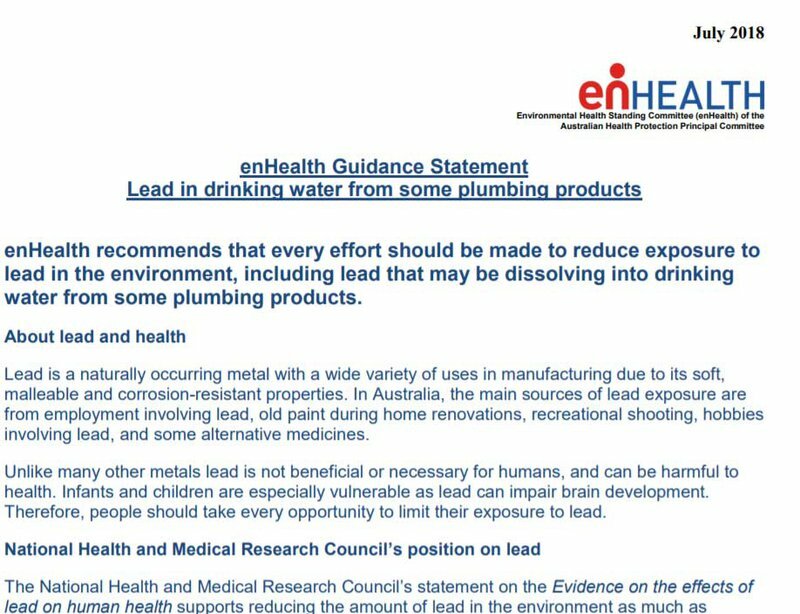 We've already talked about lead in our drinking water here in Australia. Frankly, we were rather shocked at the time when the powers that be announced that up to 6% of homes in Sydney may have the problem. And yes, we were able to help many Sydneysiders out of their lead dilemma with an on-bench or undersink UltraStream, using patented KDF heavy metals neutralising technology. "My results show that there is quite a significant concentration of lead and copper in the drinking water that is coming out of people's kitchen taps into their morning cup of tea, or baby formula,"
~Lead author of the study, PhD researcher Paul Harvey. The team tested 212 such ‘first draw’ samples, and found copper in nearly all of them, while lead was present in 56 per cent of the households tested. According to guidelines, drinking water should contain no more than 10 micrograms of lead per litre – but 8% of the lead samples contained higher levels that that. To our knowledge, it was first reported on SBS TV Australia on the 11th of August this year. But here's the problem: how long had it been known? 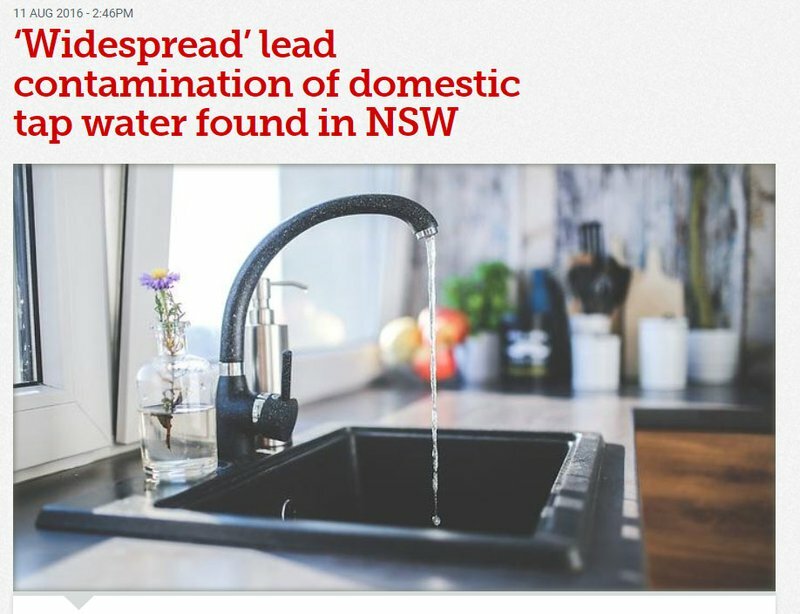 And considering lead in water has a cumulative effect on consumers, one wonders how this report was ignored for months before SBS TV had a slow news day and decided to publish it. But.. was there any action? Nooo. of course not! 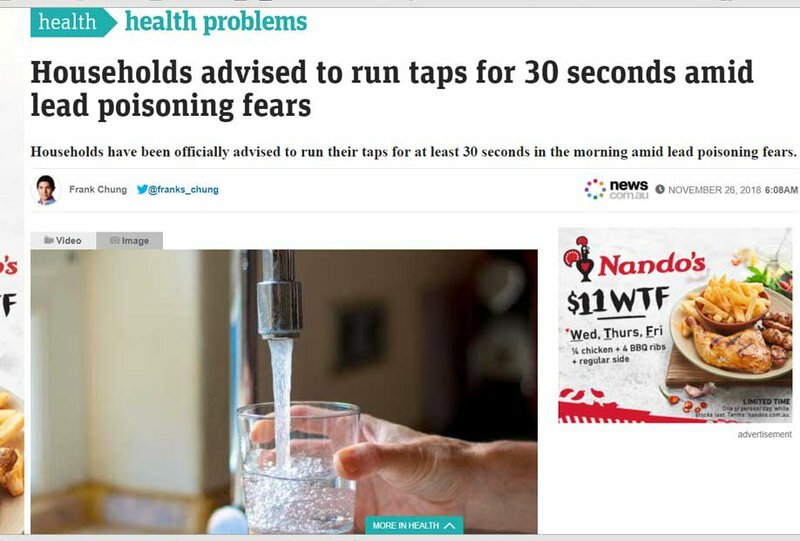 Now we have yet another report, this time advising we run the tap for 30 seconds before every use. Everyone.. not just affected homes in declared areas. So.. what aren't we being told? Lead came to the world's attention when Flint Michigan elders decided to save money by rerouting the town's water supply through the old reticulation system (much of which was LEAD. 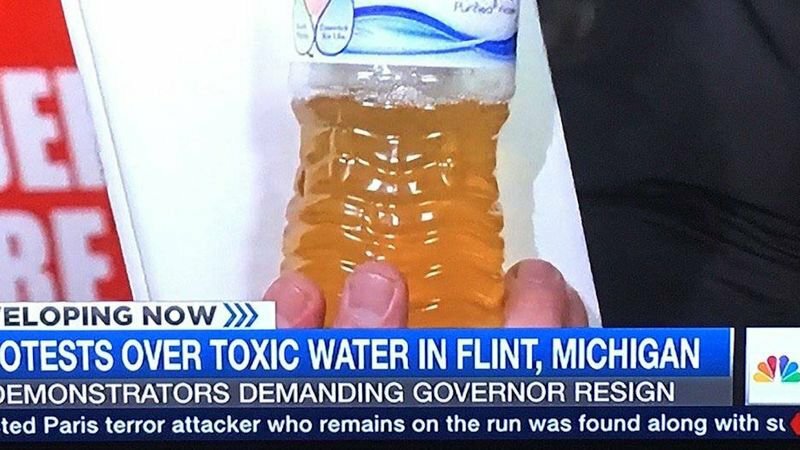 The result was devastating and even now, years later, Flint residents are receiving free bottled water from the government as they struggle to find the millions (and millions) required to fix things. It makes me wonder why australians have been told to run their water for 30 seconds every time they use the tap when in Flint they have at least understood that the water they drink daily is ruining lives of parents and affecting the IQ of kids. Is it the lawyers who advised the government to suggest the 30 second rule, and avert attention from FIXING the problem because it may break the national bankroll? Water experts in the US have all come to the same conclusion: the US water reticulation system is so old and so dilapidated that to really fix it would break the budget. 2. Give everyone plastic bottled water daily. 3. give everyone a water filter that removes lead. Of the 3, the only one that is affordable and less environmentally calamitous is to have a water filter that removes lead. 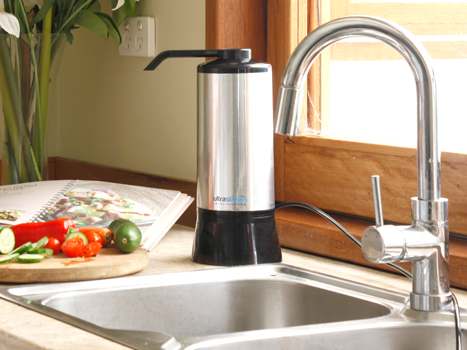 The difficulty with this is that when you start asking questions about almost any benchtop water filter, you'll discover more blank looks than data. Because the vast majority of the sort of water filter you find in a big box store have never been tested for the life of the filter. Testing has been confined to one test of a new out of the box filter. 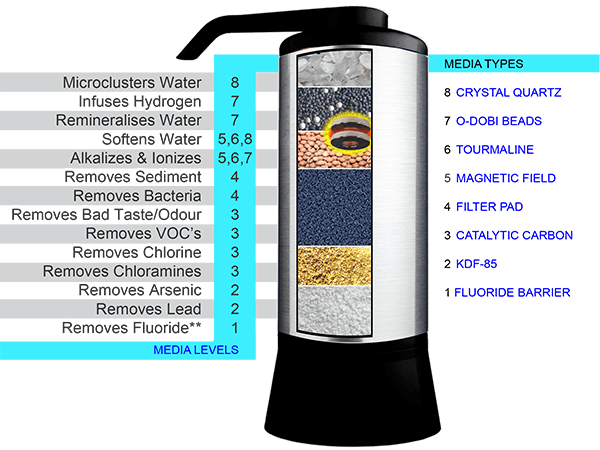 It only tells you what it will remove at day one of use, ignoring the home truth that all water filters degrade from day one! That's just what they do! When we designed the UltraStream we were determined to make the most of our opportunity to create something better than anything else on the market. We asked our USA engineers to source the absolute leading edge proven filtration media.. and hang the cost! Then we subjected the prototypes to independent laboratory testing over the expected life of the filter. Alkaway's own design UltraStream. Australia design, USA manufacture. We get that warm and fuzzy feeling every time anyone asks us the difficult questions about the relationship of filter life and filter effectiveness. We just send our link to the report. If you go to a big box store and ask about lead reduction you'll talk to someone we like to call a label reader. If you go to our website and talk to us you're talking to a true been-there, done that specialist. This is a very, very important issue. Lead has been removed from fuel because it was found to be carcinogenic. lead has been removed from paint because even touching a lead paint coated wall was causing problems with kids. So why should we now have to rely on teaching our kids to wait 30 seconds after turning on the tap? Let's face it. It's not gonna happen. We have families who own the UltraStream who tell us their kids refuse to drink water from anywhere else. We have families who have begun actually drinking UltraStream water when they never ever had a water habit. We have people sending us stories almost daily of what the UltraStream has done for them. There are over 10,000 UltraStreams out there now assisting families like yours. Check us out. We have a viable, tested solution.